Some teens will take desperate steps to get some alcohol. They’ve found ways to purchase alcohol online, convince siblings and friends to buy it for them, and share it among themselves at parties. One of the most common ways teens illegally obtain alcohol is with a fake ID. Fake IDs have gone through a transformation in the last few decades. Now, obtaining a fake ID is as simple as asking an older sibling for their old ID, or performing a quick search online. It isn’t very difficult to find websites listing fake IDs for sale. Teens use their picture and information and find high-quality printers that can create official-looking documents. Other teens use an older sibling’s old ID as their way to get into bars or buy booze. Since teens can access fake IDs pretty easily, it’s important to be aware of whether or not your teen has one. Fake IDs don’t always work and your teen may have a fake that wouldn’t fool any bouncer or clerk no matter how hard they try. However, many teens are able to slip past the system with their fake IDs. There are a few things you can watch for to determine if your teen is using a fake ID. Many teens think using a fake ID sounds thrilling rather than dangerous. Each state has different penalties if you’re caught using a fake, but the user might receive a punishment between a $500 misdemeanor and a criminal impersonation or forgery charge. Most laws will suspend the user’s drivers license if they are caught in an attempt to purchase alcohol with a fake ID. It’s important to have respect for your teen’s space and property, but parents sometimes need to step outside these boundaries to protect their teens. 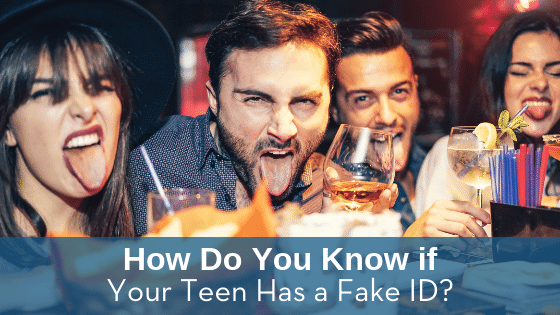 If you do have serious concerns or notice warning signs that your teen is using a fake ID to buy alcohol, be on the lookout for receipts from grocery stores or check their car for stowed alcohol. You don’t always have to search through your teen’s room or car, but sometimes it’s not a bad idea. Next ArticleHow Do You Support Your Teen After Drug Treatment? Previous ArticleCelebrate Red Ribbon Week with a Photo Contest!